Last night we watched Jurassic Park 3 and today found you can have a little dinosaur all of your own! Sony have robot dogs, Phillips robot cats (albeit stuck sitting in one place) but Ugobe have little robot dinosaurs called Pleo. In the videos they do move like little baby creatures and the lady in the shopping mall coos over one as she strokes it. emotion – they have a relatively complex model of basic drives rather like Cynthia Breazwal describes in her book “Designing Sociable Robots“. For researchers there is an open architecture so it should be possible to play oops experiment with them 🙂 The API doesn’t seem to be published yet, so wait until you get your cheque books out! I just wanted to print a file, now it is an hour and a half later and I still have nothing … this is where all our time goes gently coaxing our computers in the hope they may do what we ask. Such a simple thing to want to do … and so much pain on the process, and so many simple things that application designers could do it make it better. The lights are on in Lancaster City Centre. After three years FireFly has its first real public outing. You can see them now and for the next few months in Dalton Square in the centre of Lancaster. The initial idea for FireFly came after a meeting where we had been discussing various forms of public displays. For some reason, a thought struck – those tiny lights that you see in trees outside hotels and in city centres throughout the year; what if you could turn those into a display? That was in early 2004 and now after several years of Joe Finney’s ingenuity and Angie Chandler’s hard work, they are here. Behind each of the three thousand lights in the CityLab display is a microprocessor as fast as my first PC! If you are near Lancaster in the next few months do go see them, they are just by the City Hall, under the beady eye of Queen Victoria’s statue. When is an empty directory, not an empty directory? On the forum of our MRes course at Lancaster one of the students posted a link to Middle Ages Tech Support on YouTube. 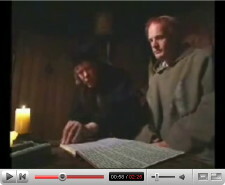 It shows Ansgarr a Mediaeval monk struggling with his first book. I first saw this video when I was giving a talk at University of Peloponnese in Tripolis. Georgios1 showed the video before I started, just because he thought it was fun. I was talking a little bit about physicality and the video brought up some really interesting issues relating to this and usability. Although it is a comic video we can unpack it and ask which of the problems that Ansgarr has as he changes technology from scroll to book would actually happen and which are more our own anachronistic view of the past. Nad did a brilliant guest lecture for our undergraduate HCI class at Lancaster on Monday. His slides and blog about the lecture are at Virtual Chaos. He touched on issues of democracy vs. authority of information, dynamic content vs. accessibility and of course increasing issues of privacy on social networking sites. He also had awesome slides to using loads of Flickr photos under creative commons … community content in action not just words! Of course also touched on Web3.0 and future convergence between emergent community phenomena and structured Semantic Web technologies. By chance I just came across this BBC New article “Iraqi bloggers at home and abroad“. Short poignant snippets from active bloggers from Iraq: Mohamed a dentist form Baghdad, Sunshine a 15 year-old girl in Mosul, Najma an engineering student at Mosul university and Riverbend who recently left Iraq to become a refugee in Syria. In each case I was amazed not just by the stories, but by their hope and spirit amongst appalling conditions. I loved the names of the blogs of Sunshine and Najma: “Days of My Life” and “A Star form Mosul”, and was humbled by Riverbend’s description of her new neighbours: one a Christian family escaping persecution in Kurdistan and another a Kurd family driven from Baghdad and yet showing kindness in trouble and poverty – a toothless boy bringing cake. This is now old news (it takes me a long time to get to the blog! ), but anyone in the UK will know the story of the missing child benefit disks â€“ 25 million records containing parents and children’s names addresses, dates of birth, bank account and national insurance details … an identity fraudsters’ gold mine. This has caused worries of millions of parents and embarrassment for Alistair Darling in Parliament. The BBC has a timeline of the events and Computer Weekly has (very) slightly more techie focused account. Anyway a week ago last Thursday (22nd Nov) I did a short radio interview on Radio Cumbria, which forced me to consider the issue in a little more detail. I think they expected more a security angle, but obviously this is very much a human story also. Despite the gravity of the event I was shocked but not surprised. In the end if you put people in a severely time pressured, cost-controlled context mistakes will inevitable happen.